The documents on display in Amy Jorgensen's The Body Archive: Residual Evidence must be among the most gregariously challenging photographs ever shown. (At the Central Utah Art Center in Ephraim through December 6 and at Art Access from 15 June through July 30, 2007.) Large and colorful, they are full of the optical pleasures and implied importance of the more accessible abstract paintings they resemble. The challenge comes from figuring out what they are pictures of. Judging by the enthusiasm of those studying them in the gallery, this question -- which they have in common with other abstract art works -- can be ignored without derailing the purely visual pleasures they so richly bestow. But to do so is to overlook a bellwether artist whose strategy for navigating the currents of present day photography reveals as much about her art as she means it to say about human experience. There are several things that human children do spontaneously that no other species does. At about the age of eight months, we begin to point to things we see (blind babies point to things they hear) and to look back at our parents to see if they join in our discoveries. This is not the watch me behavior, the evidence of developing identity, that comes much later and may play a large part in socialization. Instead, this behavior marks the first appearance of something best described as intersubjectivity: proof that we are genetically predisposed to escape the capsule of our individual being, the metaphorical and literal skin in which we find ourselves marooned at birth, and forge a common subjective experience with what will become our community. The second unique thing we do, as soon as developing manual skills permit, is to make images of what we experience. We draw, we sculptin one way or another we model our perceived and shared reality. In this regard, one of the great boons of modern technology was the deliberate invention, going on two centuries ago, and the subsequent development, of photography. It should be lost on no one that the most prolific and exploited image-making technology -- our dominant way, if not of seeing, then at least of feeding images to our eyes -- is also completely accessible to virtually anyone and everyone. Few of us can draw a credible likeness, but even in the presence of the thing itself we are likely to reach for its photo. And if none exists, or there is no recent portrait, then we reach for the camera and make one for ourselves. My friend and I, admittedly somewhat conservative-looking women of a certain age, are the first visitors at the MoMO Gallery in the east end of Kansas City’s Crossroads Arts District for the First Friday Gallery Crawl in November. We’re met at the door by the gallery owner, who blocks the entrance in his wheelchair and seems uncertain as to whether to invite us in. When I explain I’m in town to explore Kansas City’s version of an arts district and to share what I learn with artists and city visionaries in Salt Lake City, he hesitantly lets us in. After explaining that his gallery tends to display “edgier” art, he allows us to preview the show that will open that evening. The extremely graphic photos featuring naked bodies, leather, ropes, chains, and whips (use your imagination) may explain his hesitation. But this is, after all, edgier art and the eastern edge of the arts district, the place where emerging artists have moved as the increasingly popular Crossroads District develops and becomes less affordable. Two exhibits in Utah County this month will allow you to examine and explore modes of depicting the religious and spiritual life. The Springville Museum of Art's annual juried exhibit on the theme is open through December 27th. North of Springville, the Brigham Young University Museum of Art's Beholding Salvation, displays historical and contemporary representations of Jesus Christ. The majority of the works come from the University's collection, including works by Carl Heinrich Bloch, Albrecht Dürer, and Rembrandt. In addition to these historical works, the includes works by contemporary artists such as Ron Richmond and Brian Kershisnik. The latter's "The Nativity" was the sujbect of a paper by Bren Jackson presented at the Museum's Biennial Art, Belief, Meaning Symposium, in November. The following is an abbreviated version of that paper. 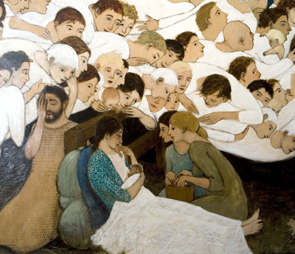 In The Nativity (2006), Brian Kershisnik explores a traditional theme in a subjective manner: the artist’s own experiences become the inspiration for his interpretation of the Holy Family. The Nativity echoes both his understanding of relationships between men and women and his desire to understand those relationships. The mystical fellowship of sisterhood he has personally observed, particularly between his wife and her sisters, is played out in Mary and the midwives, while his own experiences with the bewilderment and confusion of fatherhood leaks into Joseph. These human qualities of Mary and Joseph in the nativity serve as a reminder that ordinary people have the potential to become holy. Within any nativity scene is the motif of the Madonna and child. This popular subject exemplifies the ideal mother and child relationship, a theme that has appeared frequently in Kershisnik’s work. A pregnant woman, as Kershisnik says, is the most beautiful thing in the universe; “That pregnancy is beautiful because they [women] are Mary.” As a Latter-day Saint, the artist seems to emphasize motherhood as a divine calling. His paintings of women and children inspire a sort of sacred intrigue. The mothers in his works hold their children with confidence and peace. They act fearlessly upon intuition and bear an intelligence of things seemingly foreign to men. They find comfort in relationships and in the company of other women.